Scooper - Technology News: Which American state has a bigger economy than India? Which American state has a bigger economy than India? 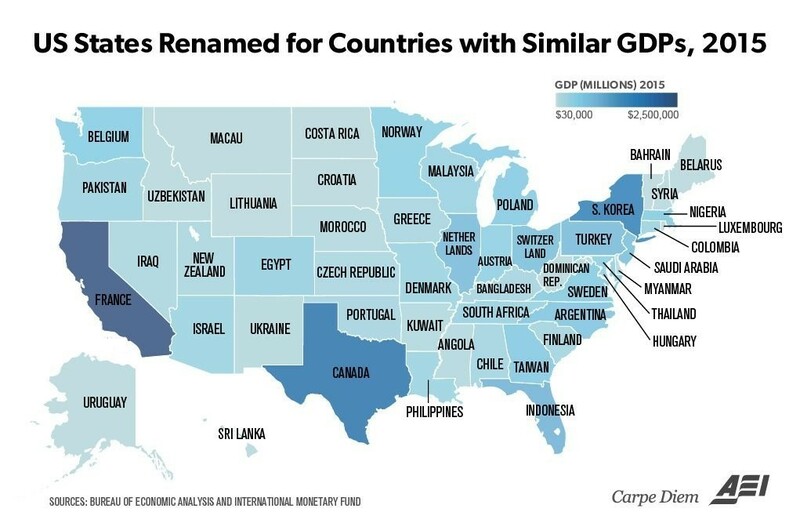 The GDP of each state in the United States is equivalent to that of a major nation in the world, according to a recent analysis by the American Enterprise Institute ( AEI ). Using statistics compiled by the Bureau of Economic Analysis and the International Monetary Fund, the AEI was able to match the GDP of each state against that of a country. The American state with the biggest economy is California, which, in 2015, produced $2.44 trillion of economic output. Its GDP compares favourably to that of France, which produced $2.42 trillion during the same period. Particularly interesting to note is the fact that California has 6 million fewer workers than France, yet produced a little over its GDP. This suggests that, in productivity terms, the US outperforms its European cousins. Even more interesting, if California were inserted into the world ranking by GDP according to country, it would come sixth – ahead of France, India, Italy and Brazil. But California is not the only state with a strong economy. The US’s second-largest state by economy, Texas, has an output of $1.643 trillion, which sandwiches it between that of Brazil, with $1.64 trillion, and that of neighbouring Canada, at $1.552 trillion. Once again, that’s despite a smaller workforce: Brazil’s workers outnumber those of Texas by round 80 million, and Canada’s workers outnumber Texas’s by 6 million. New York State came in third, with an output of $1.442 trillion, putting it ahead of South Korea, currently the world’s 11th-largest economy. Oil-rich nations are put into an interesting perspective on the map. Even with all of its oil wealth, Saudi Arabia’s $653 billion output was below that of US states Pennsylvania ($689 billion) and Illinois (($775 billion). The GDP of the United Arab Emirates rivalled that of Minnesota, but came behind 15 other states. That of Iran was a similar story, outpacing Maryland, but lagging behind Washington, Michigan and Massachusetts as well as 11 other states. The exercise by the American Enterprise Institute shows the sheer scale of the US economy, which produces almost a quarter of the world’s economy (24.5%), with only a fraction of the workforce (4.5%). If they were placed in the IMF’s list of countries by GDP, six of the US states would appear in the top 20, and three (California, Texas and New York) would appear in the top 11.